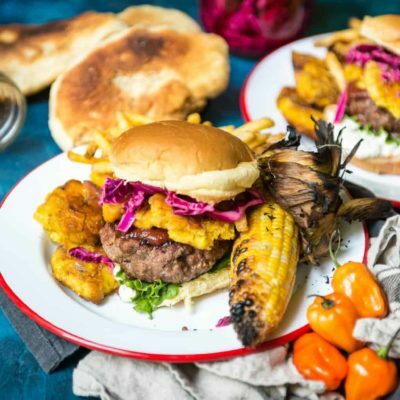 Transport yourself to an island vacation with this Caribbean-Jerk Lamb Burgers with Tostones. 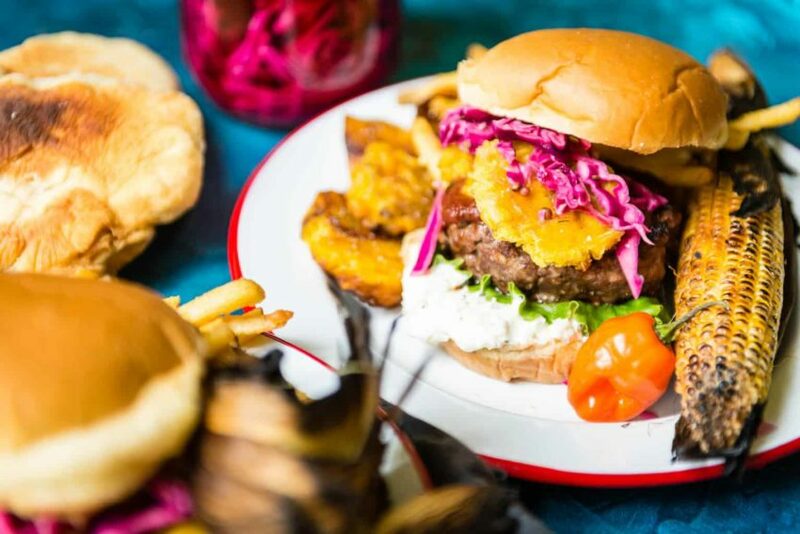 Jerk rubbed lamb with whipped goat cheese and pickled cabbage make this burger recipe perfect for chasing Caribbean food cravings. It started with plantains. Thick and ripe waiting to be ignored in a market in Maine. Surely they aren’t moving a lot of plantains in the Pine Tree State. They were laying there next to the jicama and coconuts and instantly I wanted to be dipping my toes into that clear ocean water. Food memories are some of the strongest memories I have. Sure, we can chalk that up to being a foodie who has traveled the world. But, I think we all have strong ties to food memories. Whether its grandma’s classic sauce, a college friends quick ramen fiesta or a parent’s one-of-a-kind chocolate chip cookie, we can all distinctly pull on a memory from that flavor. For me, some of my favorite food adventures have been mingling in the crowded marketplaces of other countries. It is a daily stop where all life must pause to pick up needed supplies, mingle, and interact with others. I am often met with big smiles and notions of encouragement to try this or that. There is steam and flavorful smoke rising from what seems like hundreds of carts, piles of fresh produce and local candies tempting the children. Recent harvests plucked and hanging to be taken home and cooked. There are chickens walking around unaware of their fate and children playing with sunglasses and soccer balls. I can taste the warm fried sweet potato handed to me in Cambodia, the seared kabob from a vendor in Morocco and the fried dough from a food cart in Peru. Each moment more about the experience than the food. A lot of my memories blur through time in my past, but each meal shared while traveling sits as a marker through my wanderings. A guidepost to remind me of where I have been. The other night, a food memory hit as I was wrapping up my Burger Month info and thinking about recipes. 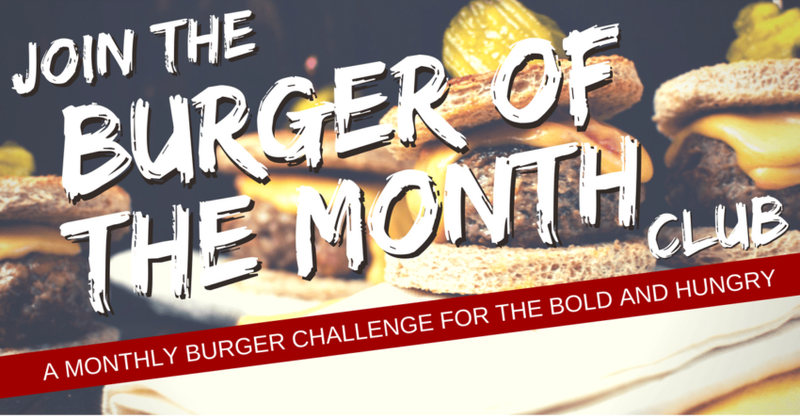 I had made a crazy delicious prosciutto wrapped veal burger, a local infused maple pork burger, and an indulgent bourbon and beef burger for the month, trying to round out thank you’s to the great sponsors for the event. But I was dreaming about lamb and how all over the world, I have enjoyed it. Inspiration struck and before I knew it I was knee deep in memories from the medinas of Morocco to the shores of Jamaica. 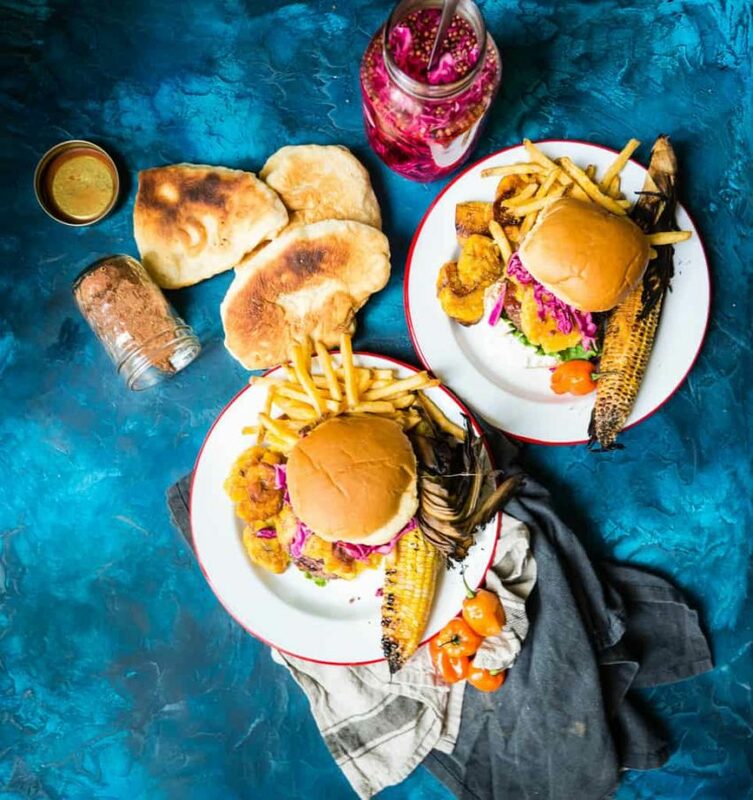 Wanderlust hit hard, but I sedated it with research and a happy plan to make a burger that could sum up those delicious food travels and transport you to a place with me. It started with plantains. Specifically, fried plantains commonly found in Latin countries called Tostones. The trick, thick cuts of plantain fried, twice. The double fry is what makes these babies magic. Plantains aren’t as sweet as bananas, so these freshly salted hot snacks are a favorite of mine. The craving hit hard, and the path had my wandering my food memories for other signature Carribean flavors. We had a curry burger this month, so I wanted to spice things up in another way. Jerk. 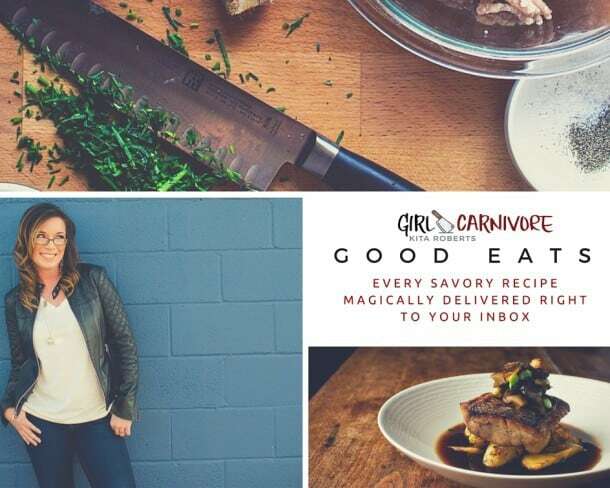 Jerk seasoning is spicy and perfect with all meats and is a basic combo of allspice (and a lot of it) and heat, usually Scotch Bonnet Peppers, but other flavors can be added in to round out the spice mix. I started with Jo Cooks base recipe and altered some things for my idea. From there, Lamb. Ground lamb is a perfect surprise for burger lovers with a uniquely different flavor. The lamb rubbed in jerk seasoning char-grilled held everything in place. I sourced local goat cheese, made a rosemary whipped cheese. Pickled some cabbage and a friend helped fry some roti (a common street food, a simple fried dough) for buns. A quick smear of Red Duck Smoked Ketchup and everything came together in one bite. This was the flavor of the Carribean I missed so much and it started with simple plantains. 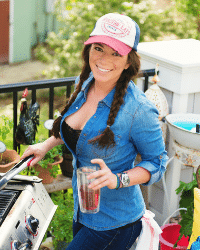 Have you entered to win the Ultimate Burger Grilling kit yet? Um, why not? Combine the red and white vinegar, garlic, brown sugar, salt, and pepper in a jar. Seal with the lid and shake to combine. Add the shredded cabbage and cover to the rim with water. Seal and allow to rest for 3 to 4 hours before using. In a resealable jar or container, combine all of the spice ingredients. Seal and shake to combine making sure everything is evenly mixed. Use a fork for additional mixing if needed. Store for up to 2 weeks. Peel and slice the plantains into 1" chunks. In a heavy-bottomed pot with high edges, heat 1/2 inch of cooking oil. Add the plantains and fry until golden on one side, about 2 minutes. Flip and fry the other edge. Remove to a paper towel-lined baking sheet. With a fork, smash the plantains down (don't be all aggro here, just enough to flatten them to about 1/4" thick disks. Carefully return the plantains to the pot and fry another 2 to 4 minutes per side until they are golden and crispy all over. Remove to a new paper towel lined plate and season with salt. In the bowl of your stand mixer, or with a hand mixer, whip the goat cheese, rosemary, and mayo together until combined. In a large bowl, combine the ground lamb with the minced garlic, scotch bonnet pepper, jerk spice and salt and pepper. Mix with your hands and form into even patties. Press an indent into the center of each to ensure even cooking. Cover and return to the fridge to chill for 30 minutes to 1 hour. When ready to cook, preheat a charcoal grill for indirect cooking. Grill the patties until they temp at 160 for ground lamb, flipping once as needed for even cooking. Remove and allow to rest on a platter while you assemble the burgers. Toast the burger buns until lightly golden. Slather the bottom buns in the whipped goat cheese. Add a layer of green leaf lettuce. 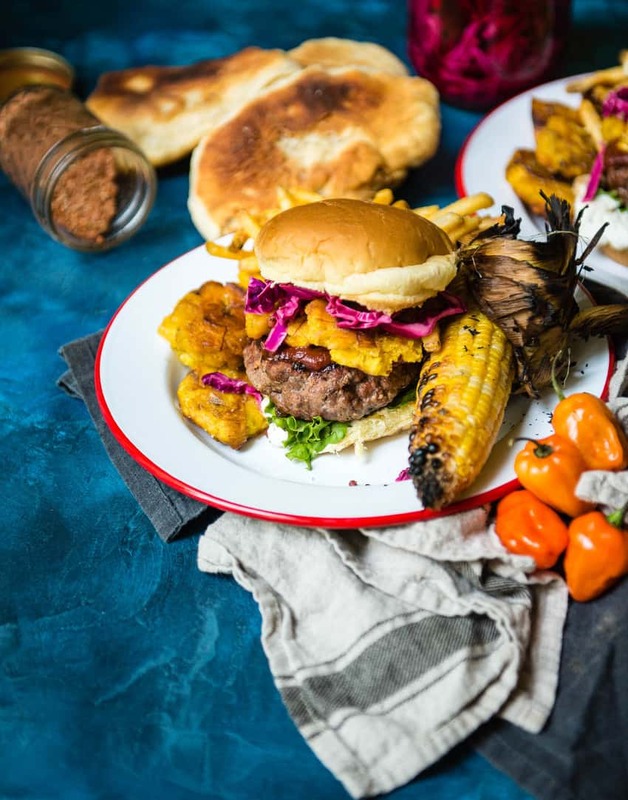 Top each with a ground lamb burger, a smear of Red Duck smoked ketchup, tostones, red cabbage and the remaining bun half. 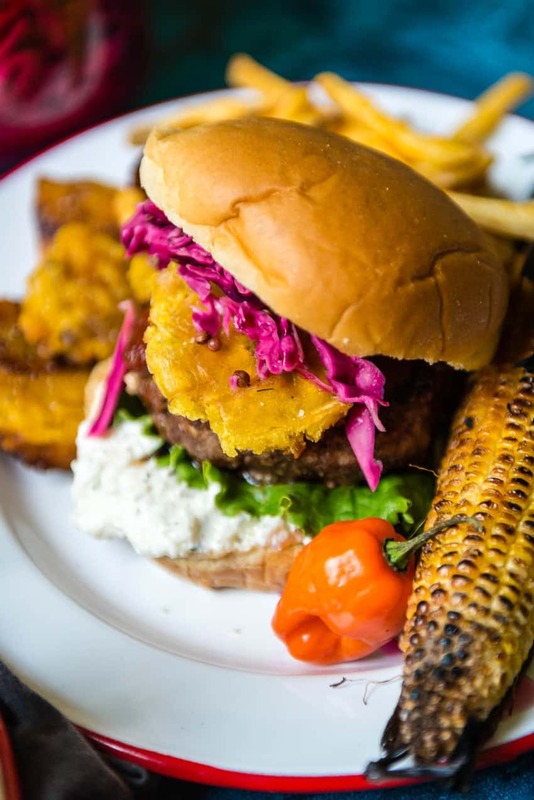 Serve with additional fried tostones and enjoy.